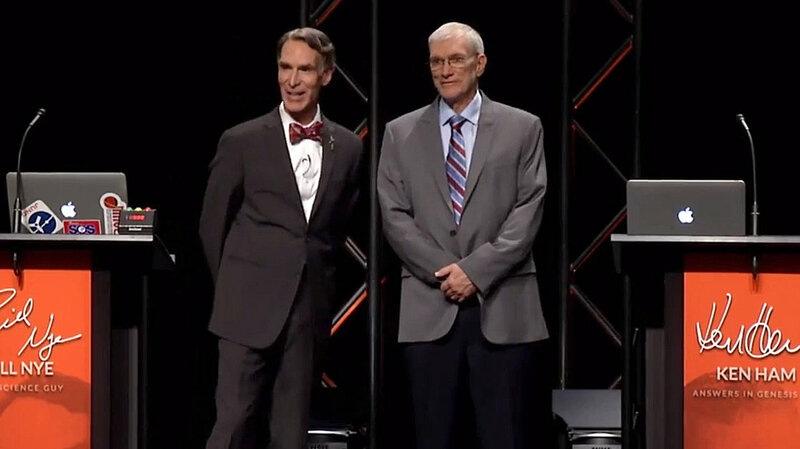 Bill Nye (left) and Ken Ham (right) at their debate at the Creation Museum. Credit: Answers in Genesis (YouTube). Last week, the world saw a rare sight: a creationist debating an evolutionist in public. Bill Nye “The Science Guy” has a degree in mechanical engineering, is an agnostic, and believes in evolution. Ken Ham has degrees in environmental biology and science education, is a Christian, and believes in Young Earth Creationism. Bill Nye is famous for his eponymous television show, where he brought scientific concepts to children, including evolution, in a humorous fashion. Ken Ham is known for his Creationist projects Answers in Genesis and the Creation Museum. On February 4, these two media heavyweights in their respective fields went head-to-head at the Creation Museum itself over the topic, “Is Creation A Viable Model of Origins?” You can watch the debate here. Now, to start off, I will say that I have degrees in astrophysics and math, I am a Christian, and I believe in evolution. Obviously, I do not take the Genesis account in the Bible literally, like Ken Ham does. I certainly respect people who do believe in a six-day creation–I think that’s a valid theological interpretation, even though I don’t agree with it. But I have a real problem when they try to present it as science. I do not consider it a valid scientific interpretation. So I did have a dog in this fight going in. And coming out, I think that Bill Nye “won” the debate, not in that he changed Ken Ham’s mind (he didn’t), or that he changed many people’s minds in the audience (he probably didn’t), but in that he presented a better argument. 92% of poll respondents, even on the evangelical website, Christianity Today, agreed with that assessment. However, Bad Astronomer Phil Plait, writing after the fact, made what I think is a very important point: roughly half of the population of the United States believes in some form of creationism. To put it more succinctly, these views are already legitimized in the public eye. Even though scientists see these ideas as being the furthest thing from on equal footing, much of the public doesn’t, and that means we have more to lose by not debating. Plait also made another point, which I had concluded myself pretty quickly: we need more Christians to debate the side of evolution. There are plenty of us out there who believe in it, probably nearly as large a fraction as the general population (after all, Christians are still 75%+ of this country). The trouble is getting the credentials. Scientists are disproportionately atheists and agnostics, and this is even more true in the life sciences. I myself would be fine debating the age of the universe with a creationist, but I would be a lot less confident about my knowledge of biology. I’d really like to see Ken Ham debate a Christian biologist, geneticist, or something similar, who believes in evolution. A second problem, and a more general one, though one I think was kept well under control in this debate, is being very careful about the topic of the debate. I don’t think it is productive to debate whether creation or evolution is true, and Nye and Ham didn’t. Instead, you should debate one of two questions: Is creationism viable science? (As this debate addressed.) Or, Is evolution viable theology? If you debate the former, you’d better have a scientist doing it. If you debate the latter, you’d better get a theologian. I’m sure there are plenty of people without formal training who could do well at either, but you can have much more confidence in a debate between people who are well-versed in the topic at hand. In my next post, I will talk about the actual arguments, scientific and otherwise, made by Mr. Ham and Mr. Nye, and add a couple of my own. This entry was posted in Current events, Religion, Science and tagged bill nye, creationism, debate, evolution, ken ham. Bookmark the permalink. That being said I think is rather damaging to the credibility of macro evolutionists and big bang theory scientists that you have demanded only that THEORY be taught in schools. If you theory was so good and correct why on earth would you want intelligent design not to be taught? Think of it this way: if I said Muhammad Ali (in his prime) is the best boxer out there and some other guy says no Richard Nixon is the best boxer. I would say, “ok, let em fight!” It would be easy money. That is the real reason why macro evolutionists fear discussions and the scholarly study of intelligent design. I know macro evolutionists have done their best to explain away or discredit Expelled: No Intelligence Allowed, but it definitely makes a valid point.